This is an indicator that recognizes a special type of Inside Bar formation which is formed by a Master candle followed by 4 smaller candles (please see the strategy explanation below). Plots buy/sell stop lines on the chart as well as well as take profit and stop loss levels. The TP/SL levels are based on the Average True Range (ATR) indicator. 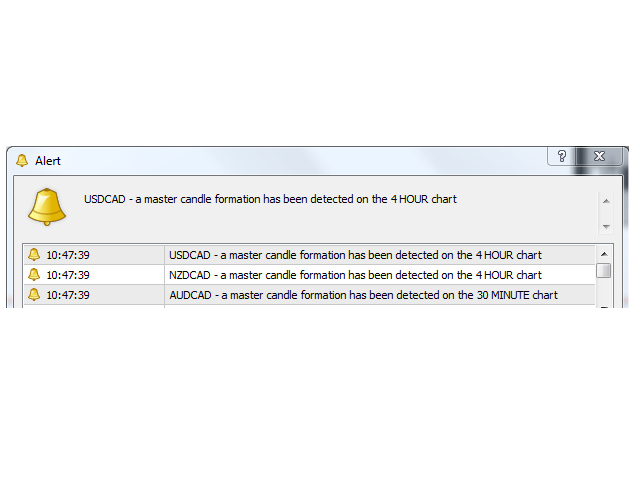 Sends you a real-time alert when a Master candle formation is identified - sound / popup / email / push notification. Once a suggestion is given, you can confirm it with your own chart analysis. Generally the best setups to be traded are the ones occurring around important supports/resistances, round numbers, supply and demand zones, etc. If you would like to use this indicator on multiple charts you might consider taking advantage of the inside bars scanning in my Pennants and Triangles scanner which you can find here. 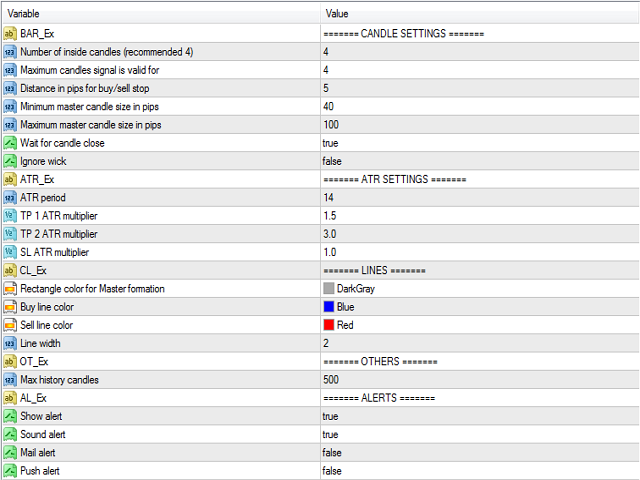 Number of inside candles: For best signal quality it is recommended to set it to 4. Please see the strategy explanation below. Maximum candles signal is valid for: This setting controls how for how long the suggested entry level lines will expand. Distance in pips for buy/sell stop: The offset/buffer for the entry lines. Recommended at least 5 pips away for Master candle high/low. Minimum master candle size in pips: Please see the strategy explanation below. Maximum master candle size in pips: Please see the strategy explanation below. Wait for candle close: true/false. Default is True. If set to False then the alert will come already when the 4th candle opens. Ignore wick: true/false. Default is False. If set to True then wicks are allowed above/below the Master candle high/low. ATR Period: Period for the Average True Range indicator. Default is 14. TP 1 ATR multiplier: Used for the first take profit level. TP 2 ATR multiplier: Used for the second take profit level. SL ATR multiplier: Used for stop loss level. 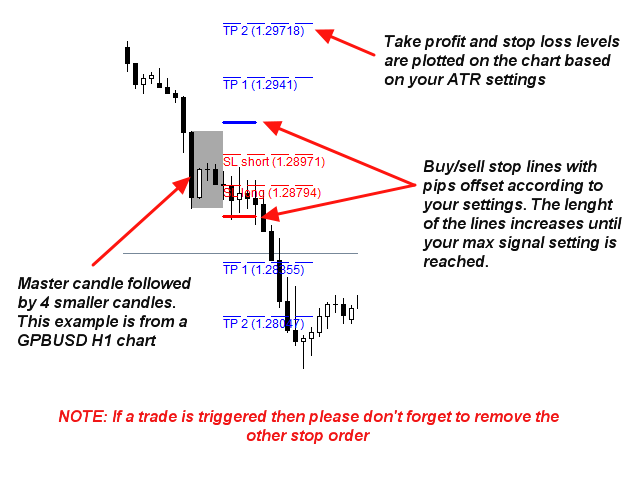 Objects: In this section you can change the colors of the Master formation rectangle and the buy/sell stop lines. You can also set the width of the buy/sell stop lines. Max history candles: For how many candles back in time the formation will be drawn on the chart.